Every livestock breed has the one Stud that surpasses all others-- not just in looks but in every element of excellence that defines the breed. 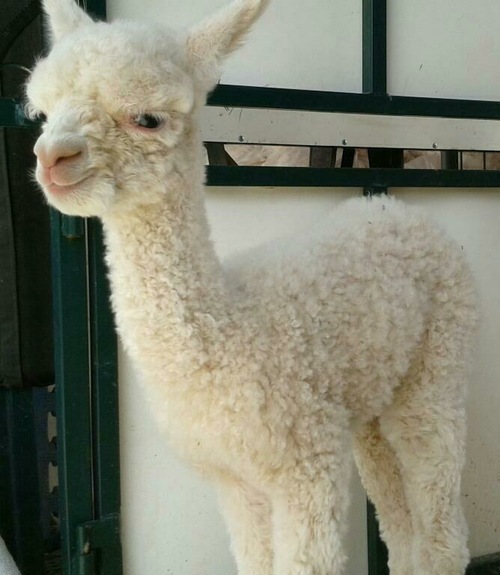 In the alpaca, this element is primarily the fleece: Fineness of micron - Brightness and soft handle - good staple length - curvature - density with low primary fiber production, and most importantly, UNIFORMITY of all these traits. 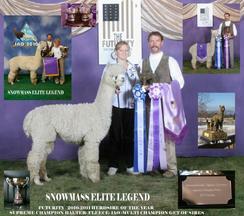 Now Co-Owned with Jay & Melissa Reeder of Apple Mountain Alpacas in GA! IF you're lucky enough to have a Snowmass Elite Legend son, then you're lucky enough.... but we are proud to say that we have an Elite Legend son WITH EPDs in TOP 1% in SDAFD and SF, TOP 2% AFD, TOP 5% in %>30, Top 5% in Mean Curve and Top 5% in % Medulation, Top 4% in Fleece Weight and Top 8% in MSL! He is clearly a leader in all traits... 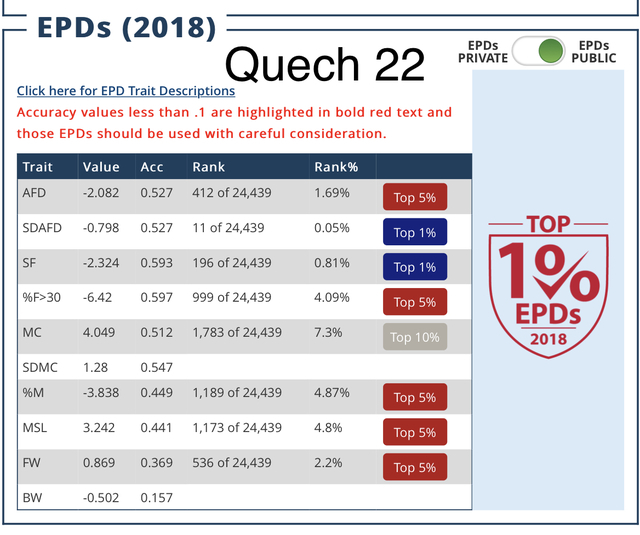 But do take a look at the EPDs you can expect Quech22 to bring to your breeding program - We're thrilled with the Value numbers. Quech 22's extremely bright fleece at age 4 comes in with an AFD of 16.6, SD 3.1, 18.5 CV and %>30 was a mere 0.3%. AT AGE 4. Yes, we're serious. Quech has a unique fleece character. 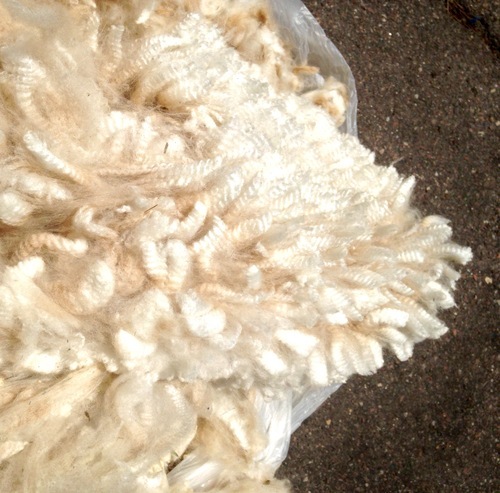 It first appeared long and 'drapey' instead of a more densely packed fleece as a yearling. He had an exceptionally bright fleece that was easily considered somewhat of a 'silky'. 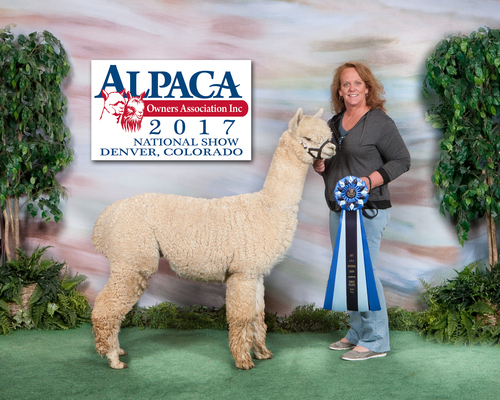 We don't mind if that isn't exactly what the show ring awards for....we know this male has the genetics and proven fleece traits himself to take our fiber growing goals into the next generation of alpaca farming - where consistant fleeces meet the textile industry standards, and are predictable for uniformity and lasting fineness, and staple length. 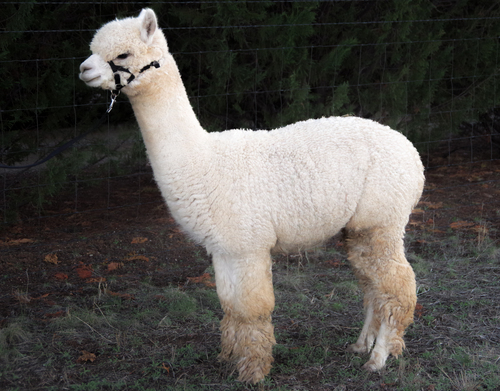 Into adulthood, Quech 22 has a denser handle to his fleece and great shear weights. Conformation is exceptional with a solid frame, very full coverage down to his toes and still that typey head. We've used him specifically for fleece traits here, but also for improving coverage and conformation traits in breeding females. He is a 'go to' breeder that packs a lot of improvement possibilities into the pairings. 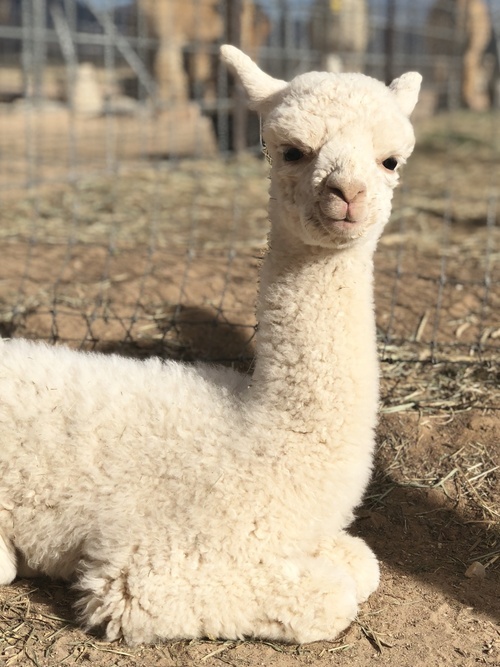 Quech was put into production here at the end of 2016, and that first cria (female out of Hummingherd’s Delara named Spitz & Giggles) hit the ground 11/2017. We expect great things from this guy as he covers the herd in 2017/2018 and imparts his truly ELITE and LEGENDARY genetics in the next generation. 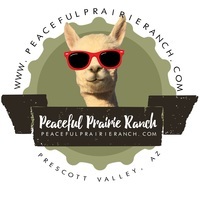 Astute breeders please contact Wendy at Peaceful Prairie Ranch (West) 928.848.0267) or Jay Reeder at Apple Mountain Alpacas (East) to schedule your breedings to this Male - ‘the Quech of a lifetime’! Brightest White & Just Right!